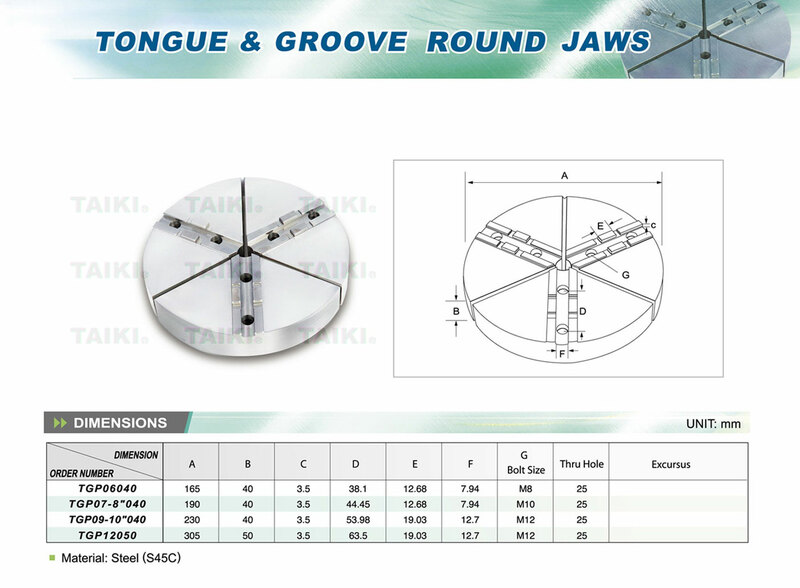 Tongue & Groove Round Jaws(TGP12050) - Taiki Industrial Co., Ltd.
For over 40 years we have been committed to providing customers with the highest level of customer service and technical support. Providing the best quality, varied specifications and reasonable price is TAIKI’s goal in business. The Tongue & Groove Round Jaws(TGP12050) is used in CNC lathe. To suit KITAGAWA and other famous chucks. Address: No.11, Lane 468, Wufu Rd, Wufong Dist., Taichung City, 41355, Taiwan.